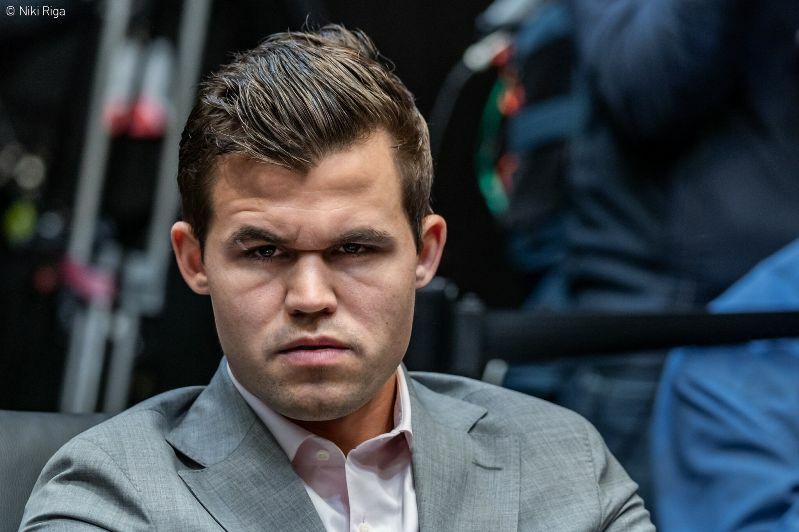 Magnus Carlsen came into the final classical game of the 2018 World Chess Championship determined to force tiebreaks against Fabiano Caruana on Wednesday, and he got what he wanted, but at what cost? His draw offer on move 31, in a better position with more time, shocked the chess world. 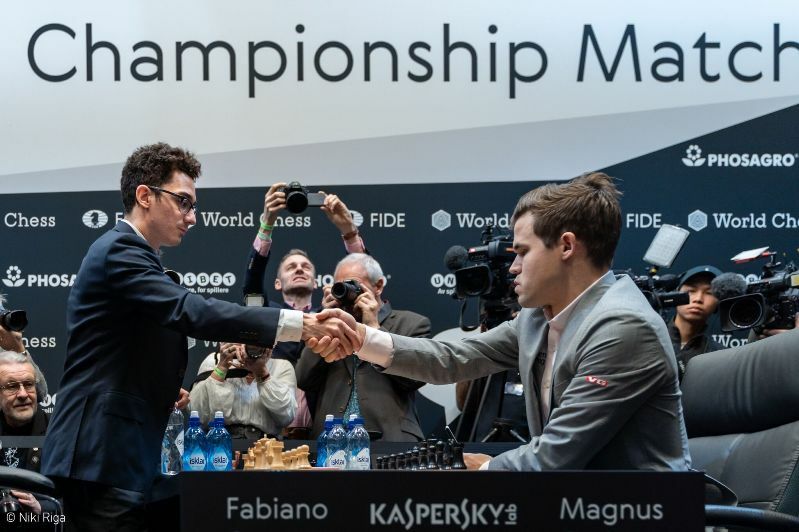 Anish Giri noted, “when his life is on the line, suddenly he’s not Magnus anymore,” which was echoed by Garry Kasparov: “Tiebreaks require tremendous nerves and he seems to be losing his.” Will Caissa forgive her wayward favourite? 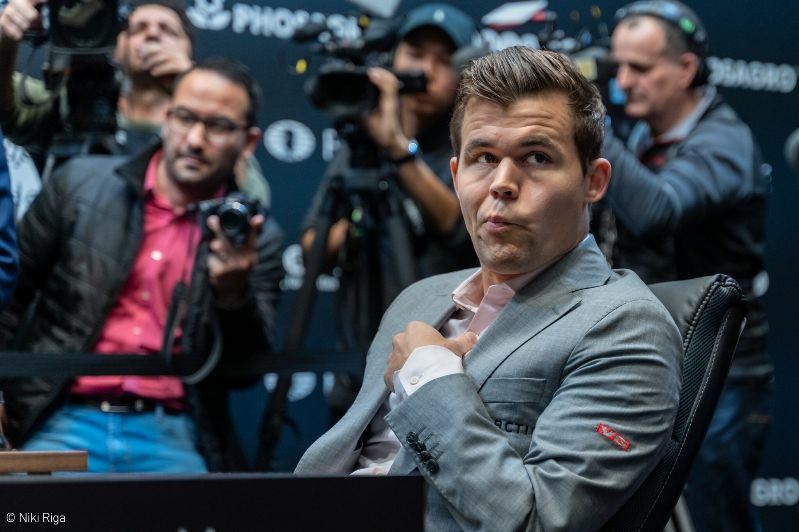 Magnus had famously played a quick draw with the white pieces against Sergey Karjakin in New York to take that match to tiebreaks, and there was no reason to think he’d have a problem with a similar outcome with the black pieces in London. He very nearly got what he wanted. That sent Fabiano into a 9-minute think, earning Alexander Grischuk’s almost daily description during the match of, “completely miserable preparation by White.” The move had actually been played in a high enough profile computer game to enter normal databases… by Stockfish against Houdini in the TCEC Season 11 Superfinal! “Bottle” here means “courage” or “willingness to take risks” in colloquial British English, and after 8 minutes Caruana found enough of it to go for 15.Be3!?. It was the first of a number of bold decisions by the challenger, the most dramatic of which came with 21.Rh2!? 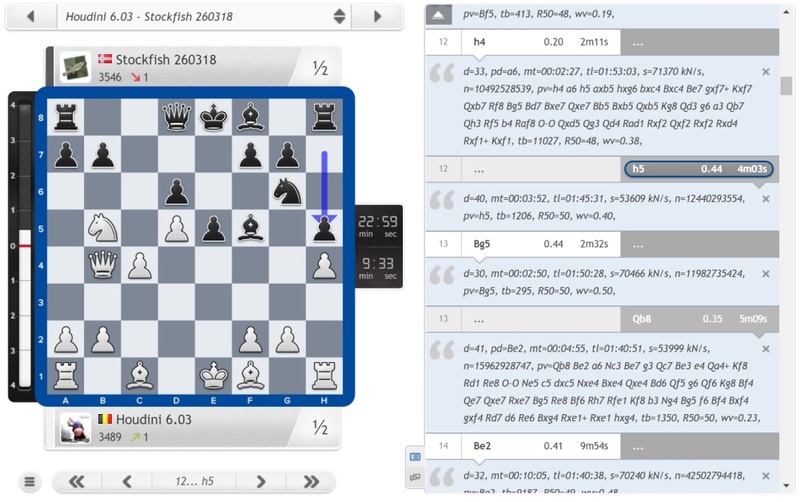 When Svidler later commented, “Fabi’s not going to die wondering [what might have been] today”, Grischuk summed things up perfectly with, “Yes, bravo for his sprit. His spirit is much better than his preparation today!" Grischuk chimed it at around this point, “It looks like Fabiano had Topalov syndrome in this game - just avoiding normal moves to avoid a draw”. That referred to the final game of the 2010 World Championship match against Vishy Anand, when Veselin Topalov committed chess suicide with the white pieces rather than play tiebreaks. This would be the first of many amnesties in the match in London, though, as Magnus quickly played 25…a5 26.Qd2 e4 rather than going for the b5-break or 25…exf4! The answer is very simple – this was just not my goal! Once again, my approach was not to unbalance the position at that point. I had a very clear path with a5 and e4 that gave me a completely safe position that I could maybe play for a win. It seemed nonsensical to go for anything else. The irony, in a way, was that despite not really pushing for it Magnus still had an extremely promising position as well as a more than 20-minute advantage on the clock. Vladimir Kramnik was giving it as 50:50 whether Caruana would survive… when suddenly, it was all over! I dunno, but to be honest I was just trying to make natural moves. Everybody could see that I wasn’t necessarily going for the maximum. I just wanted a position that was completely safe and where I could put some pressure, but I mean – if a draw hadn’t been a satisfactory result obviously I would have approached it differently. 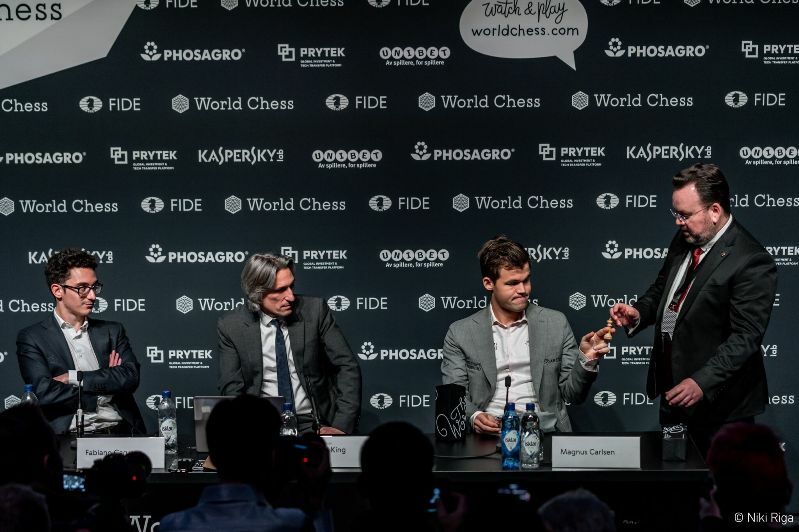 It’s highly-recommended that you check out how our own commentators Giri, Svidler and Grischuk reacted to the news of the draw, just when they were reflecting that they’d never heard the words, “I offer a draw,” come out of Magnus' mouth (and Grischuk was midway through an anecdote about the German/Norwegian coastguard and "I am sinking/thinking"...). The video should be cued up to start at that moment, while they go on to have a fascinating 30+ minute discussion of the match result, tiebreaks and the general ramifications for chess. Does something need to change? Just as a teaser, you wouldn’t want to miss Alexander Grischuk’s alternative tiebreak system! Still, there’s little doubt Fabiano has put a lot of work into perfecting his speed chess skills in the run-up to the match, and if you combine that with a little luck with preparation, and some nerves from the champion, anything could still happen. That’s all to look forward to on Wednesday, but first on yet another match rest day we have more Banter Blitz, with Sopiko at noon followed by Svidler at 13:30 CET. Don’t miss it! Game 7: Magnus "way too soft"